The Cayman Islands, located in the Caribbean Sea just below Cuba, consist of three islands: Grand Cayman, Little Cayman and Cayman Brac. They are known worldwide as one of the premier locations for scuba diving, a sport that Anne and I are passionate about. Grand Cayman, the largest of the three and most visited, is about the same size as Aruba, approximately 20 miles long and 7 miles wide, but unlike Aruba, it is not arid and desert like. There is an abundance of lush, green tropical vegetation and a variety of palm trees throughout. Our first trip to Grand Cayman was in October 1992. The purpose of this trip was scuba diving. Anne had recently completed her classroom and pool work prerequisites for her open water certification and, on Grand Cayman, she would make the required open water dives and become a certified diver. We returned again in October 1993 for a second week devoted to scuba diving and in February 2001 for both vacation (relaxation!) and diving. 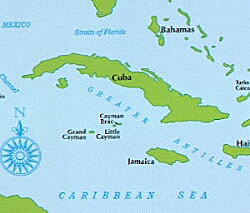 Grand Cayman, the largest and most commercial of the islands, would be our destination for all three trips. 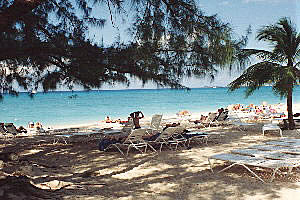 Grand Cayman is the home of George Town, the capital, and Seven Mile Beach. 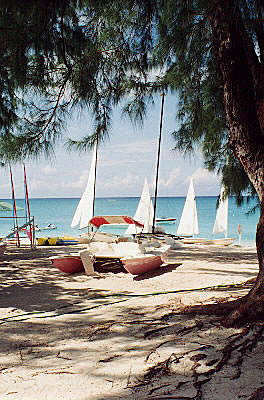 Seven Mile Beach extends from George Town northward to West Bay. Fortunately the beach is beautiful and, unfortunately, there's hardly a square inch of it left. It is the home of one hotel, resort, condo, private residence, etc. after another for almost the entire 7 miles. While all beaches are public on Grand Cayman and accessible to everyone it is rather intimidating to have so little open space along the entire beach front. George Town is also very popular on the cruise ship circuit. During our latest visit we saw the comings and goings of up to four different cruise ships in the harbor each and everyday. You can imagine what George Town was like with hordes of tourists traipsing from one shop to another in search of island bargains. Unfortunately they wouldn't find many bargains on Grand Cayman. Cayman is a beautiful island and wonderful for scuba diving, but it is $$$$$$. Unlike most Caribbean Islands you don't find poverty on the island. It's small population is apparently well off and unemployment is low. From what I understand there are no taxes in the Cayman Islands, at least those that we can readily see (like sales tax). Taxes are rolled into the price of everything you buy and it is evident by the price you pay. Prices ranged from the ridiculous to the not-so-bad and seemed to be directed at the tourists. For example, visiting the local supermarket the prices seemed reasonable given the fact that you were on an island that needs to import virtually everything. Much cheaper than Aruba by comparison. However, meals enjoyed in restaurants were outrageously expensive. To give you an example, we ordered pizza one night. It was very good with a thin crust, but it was only large enough for one person. The costs ... about 16 US$. In many of the upscale restaurants serving portions also seemed somewhat small. I enjoyed my favorite soup one evening, lobster bisque, and it was served elegantly in a large soup bowl. The only problems, there were two, were when I put my soup spoon into the soup it wasn't completely covered by the soup and the cost was about 11 US$. Most of us who travel don't mind paying the price for something, but we generally like to feel we have gotten our money's worth. That isn't a feeling you'll experience often in the Cayman Islands. While discussing serving portions I would also like to add my two-cents worth about restaurant here in the United States that give you so much food it's impossible for one person to eat it. Why can't they provide an adequate portion that would satisfy most and for the hungry diner allow them to asked for seconds? The starving populations of Earth could live on what we Americans throw away each and everyday of the week! If the purpose of your trip is diving then I strongly suggest you make arrangements to stay at one of the many hotels and/or resorts that cater specifically to divers. Doing so will save lots of money and make it much easier for you to enjoy the sport. Refer to the Hotels and Sunset House link for more specific information and recommendation.